UNITED NATIONS (CNS) — Dealing with war, development, the economy or environmental concerns, bureaucrats and diplomats always must remember that the lives of real children, women and men are at stake, Pope Francis told the United Nations. Helping to celebrate the organization’s 70th anniversary, Pope Francis visited its headquarters Sept. 25 and pleaded with government leaders and U.N. officials to keep the dignity and sacredness of every human life and the value of all creatures at the center of their concern. More than 190 heads of state were attending the General Assembly, and many of them made a point of being in the U.N.’s historic hall for Pope Francis’ speech on the eve of discussion of the 2030 Agenda for Sustainable Development and, later in the year, the Paris Conference on Climate Change. The first hour of Pope Francis’ visit was heavy on protocol and posing for official group photographs. He met privately with U.N. Secretary-General Ban Ki-moon and spoke briefly with U.N. employees, urging them to make their workplace a model of the peace and respect they work to promote around the world. He also paid tribute to the sacrifice of U.N. employees killed in the line of duty. Pope Francis called for real, concrete action to stem climate change; respect for every human life and for “the natural difference between man and woman”; economic decisions that place the needs of people before profits; and greater controls on weapons sales and the elimination of nuclear weapons. He praised recent international agreements with Iran to ensure it does not develop nuclear weapons and he pleaded for real, concrete, multilateral efforts to bring peace and justice to the Middle East, North Africa and other African countries plagued by the violence of extremists claiming to act in the name of Islam. 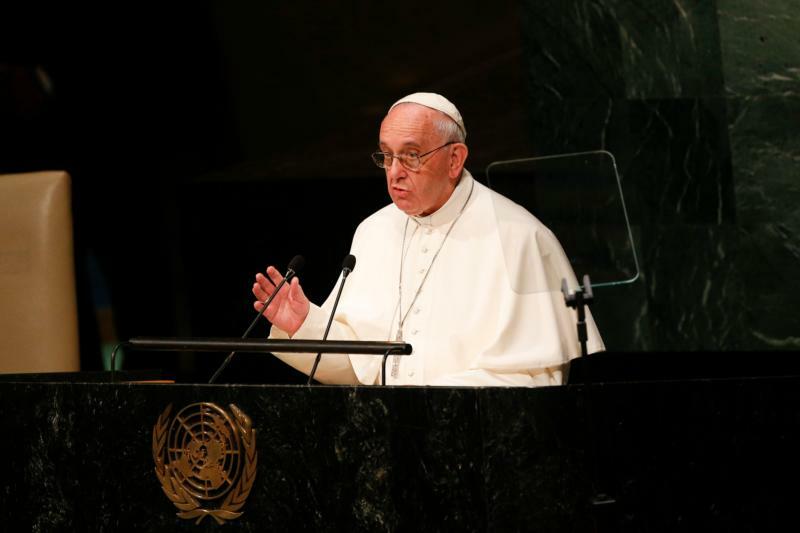 Pope Francis warned the U.N. leaders and the heads of state that too many decisions seemed to be based on the desire by a few for economic or political power, ignoring the values and rights the United Nations was formed to promote and protect. “Economic and social exclusion is a complete denial of human fraternity and a grave offense against human rights and the environment,” the pope said, echoing one of the main themes of his encyclical, “Laudato Si’.” The document emphasized that respect for creation must include respect for all creatures, human beings included, and that efforts to reduce poverty and promote development must respect both the earth and the people who live there. In the past, Pope Francis has termed as “ideological colonization” making development aid dependent on greater acceptance of homosexuality and gay marriage. The earth, “the common home of all men and women must also be built on the understanding of a certain sacredness of creature nature,” the pope told the assembly. While some people continue to question scientific evidence that human activity is contributing to global climate change, Pope Francis insisted “a true ‘right of the environment'” exists and is closely tied to human rights, since people are part of nature and are called to live in communion with it.